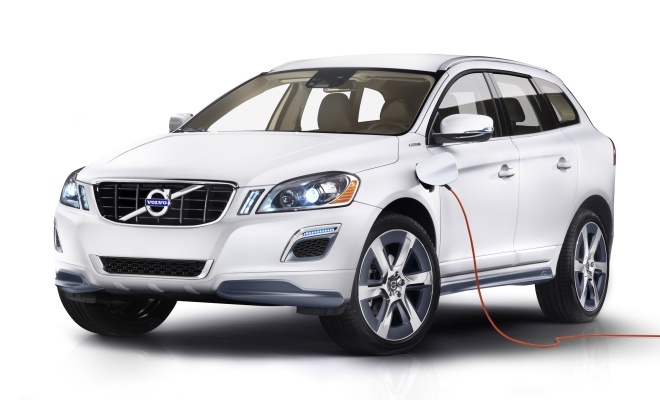 Volvo will use next week’s Detroit motor show to unveil a concept XC60 plug-in hybrid electric vehicle (PHEV). The mid-size off-roader will boast not only a powerful petrol engine but also a muscular electric motor, charged from the mains between journeys. The concept XC60 will borrow most of its innards from the V60 plug-in estate, which is in the final stages of pre-production development. But while the upcoming V60 deploys a 2.4-litre five-cylinder diesel alongside its motor and batteries, the newer XC60 will embody Volvo’s new four-cylinder strategy, in this instance employing a 2.0-litre four-pot petrol unit. With a turbo and direct injection, this new engine will develop a peak of 280bhp and a maximum 380Nm of torque, according to Volvo. 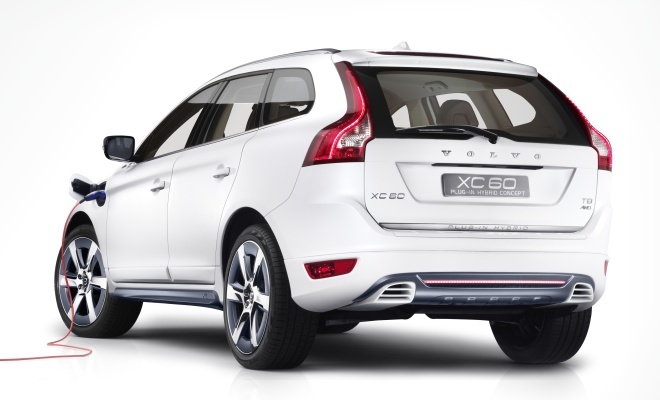 With all its ducks lined up, the plug-in XC60 should be able to scamper to 62mph in just 6.1 seconds. That’s despite the 250kg penalty imposed by all the electrical hardware – roughly the same weight as a well-fed family of four. The petrol engine will drive the XC60’s front wheels through a new eight-speed automatic transmission. At the rear, the electric module carries over virtually unchanged from the V60 hybrid, with a 70bhp, 200Nm motor driving the back axle. 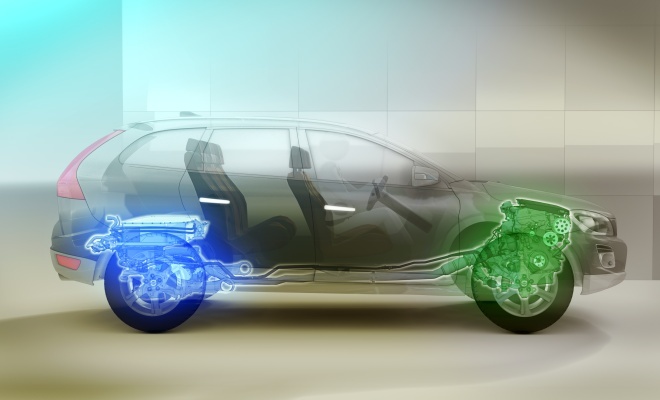 A 12kWh liquid-cooled lithium-ion battery pack, mounted under the boot floor, should provide sufficient power for about 45km (28 miles) of purely electric travel, after about three and a half hours plugged into a normal household mains supply. Fitting the V60’s hybrid hardware into the XC60 was relatively straightforward, according to Volvo’s project team, given that the two cars sit on the same underlying platform. They added that the XC60’s taller bodyshell made it easier to package the bulky battery, compromising boot space to a lesser degree than in the V60. Like its V60 sibling, the XC60 PHEV will be equipped to run in a number of modes – a default hybrid mode that will use electric assistance to maximise economy, a power mode that will prioritise acceleration (as long as the battery lasts), and a “pure” electric-only mode. There will also be buttons to save battery reserves for later in a journey, or to engage a temporary four-wheel-drive mode. The XC60 will be a through-the-road hybrid, meaning there is no mechanical connection between the petrol-driven front axle and electrically propelled rear wheels. Instead, software co-ordinates the separate efforts of the two ends. Given the combination of available modes, the car will sometimes use front-wheel drive, sometimes rear-wheel drive, and sometimes all-wheel-drive. Dedicated control software including an overhauled stability system will work hard to hide the joins, send torque to the wheels that need it, and keep the car pointing in the right direction. Volvo predicts fuel consumption of 2.3 litres per 100km (about 122mpg Imperial) and CO2 emissions of 53g/km under the NEDC test regime. Real-world consumption would, of course, depend on how the car was used, given that the contribution of a mains-charged battery would quickly wane on longer journeys. But will anyone actually get the chance to drive it? The project’s managers mumbled nothing definite about production plans, but did say any launch would be at least three years away. And if the car does get that far, expect a sticker price in the region of $50,000 in the US after grants (£32,000) – and no doubt a tidy sum more in the UK.